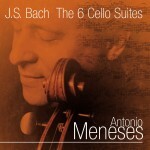 Born in Recife, Brazil in 1957 into a family of musicians, Antonio Meneses began his cello studies at the age of ten. At the age of 16 he met the famous Italian cellist Antonio Janigro and was asked to join Janigro’s classes in Düsseldorf and later in Stuttgart. In 1977 Antonio won first prize at the ARD International Competition in Munich, and in 1982 he was awarded first prize and a gold medal at the Tchaikovsky Competition in Moscow. 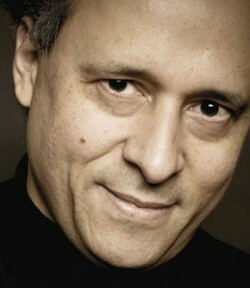 Regularly appearing in the music capitals of Europe, the Americas and Asia – including Berlin, London, Amsterdam, Vienna, Paris, Prague, Moscow and St Petersburg, Munich, New York, Philadelphia, Washington D.C. and Tokyo – Antonio has performed with most of the world’s leading orchestras. Conductors with whom he has collaborated include the late Claudio Abbado and Gerd Albrecht, Herbert Blomstedt, Semyon Bychkov, Riccardo Chailly, Sir Andrew Davis, Charles Dutoit, Daniele Gatti, Neeme Järvi, Mariss Jansons, Herbert von Karajan, Riccardo Muti, Eiji Oue, André Previn, Mstislav Rostropovich, Kurt Sanderling, Yuri Temirkanov and Christian Thielemann. 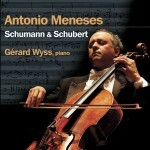 A devoted chamber musician, Antonio was a member of the legendary Beaux Arts Trio between October 1998 and September 2008. He has collaborated with the Vermeer Quartet on tour and gives chamber music concerts and duo recitals with pianists such as Menahem Pressler and Maria João Pires. 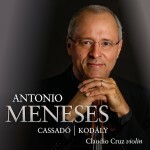 As a recording artist Antonio has made two recordings for Deutsche Grammophon with Herbert von Karajan and the Berlin Philharmonic Orchestra (Brahms’s Double Concerto with Anne-Sophie Mutter and Richard Strauss’s Don Quixote), and in September 2013 his first recording with Maria João Pires, The Wigmore Hall Recital, was released on the same label. 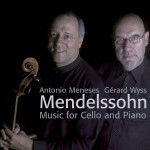 For AVIE, his recordings include the Six Cello Suites by J.S. 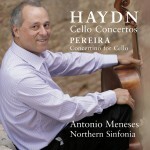 Bach; works for cello and piano by Schubert and Schumann with Gérard Wyss; a Beethoven disc with Menahem Pressler; Haydn’s Cello Concertos and the Concertino by Clóvis Pereira with the Royal Northern Sinfonia; and the Elgar and Gál Cello Concertos with the Royal Northern Sinfonia and Claudio Cruz, which received a Grammy Award nomination for ‘Best Classical Instrumental Solo’. 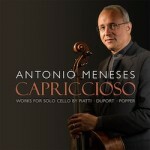 Antonio has also recorded the complete works for cello by Villa-Lobos (Auvidis France and Bis), David Popper and C.P.E. Bach (Pan Records). 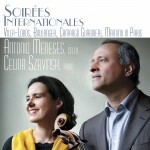 Recent highlights include Beethoven’s Triple Concerto with Augustin Dumay and Maria João Pires at London’s Royal Festival Hall; Saint-Saëns’s Cello Concerto No.1 with the Scottish Chamber Orchestra; Richard Strauss’s Don Quixote with Fabien Gabel and the Orchestre de Paris; and Bloch’s Schelomo with the Orquestra Sinfonica do Estado de São Paolo. Future projects for 2015 include recitals in Geneva and London’s Wigmore Hall with Maria João Pires. 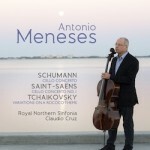 In addition to his busy concert schedule and his teaching at the Bern Conservatory (since 2008), Antonio regularly gives masterclasses in Europe (Escuela Superior de Música Reina Sofía, Madrid; Accademia Musicale Chigiana, Siena), the Americas (Domaine Forget) and Japan (Tokyo University). He plays a cello by Matteo Gofriller made in Venice c.1710. 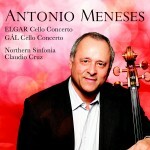 Antonio Meneses has no upcoming tour dates. Please check back soon.